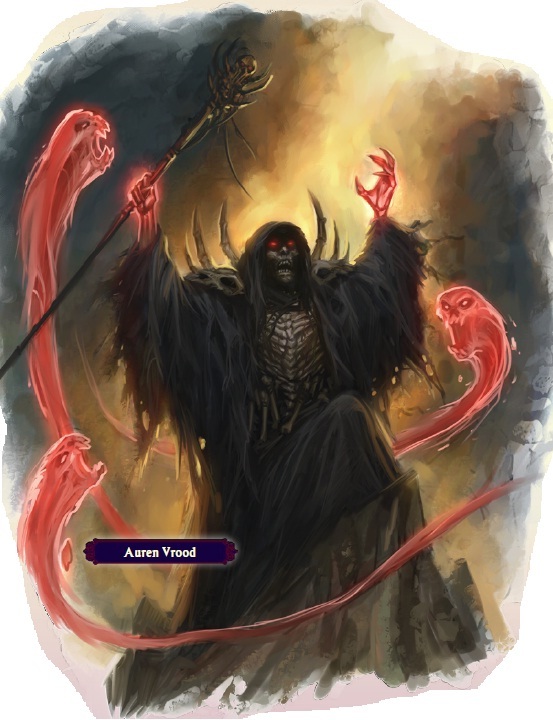 Fifth Session (18 page pdf) – Done with the local vermin, we move on to assault a keep full of necromancers! And someone dies. Many someones. Then it’s off to get some Lovecraft, but instead we get some McLovin! We planned our assault of the necromancer keep in Feldgrau. We get to the top and the “skeletons” there are uber buff skeletons to our chagrin. We pop a fog cloud to stop the arrows, except for the PCs that like going and standing out of the fog cloud so they’ll get shot. We expected a bit more of a dungeon, but halfway through the skeleton guards fight Orrin (Auren?) Vrood shows up and lays into us with the Circle of Death. This starts an entire sequence of “but wait…” as we figure out all the complex effects. He pops a Circle of Death which kills four party members – but I use the group Harrow card to give us SR20, which saves two people, then I use my personal Harrow card to give Oswald a save bonus, which saves him. (Using them is a meta-thing that doesn’t really use an action.) Zurax Darkfire, we hardly knew ye. Then we kept forgetting stuff. He used eyebite on me and I ran, forgetting the SR, and then he used it on Oswald, who almost ran before I blurted out “Wait, SR!” The SR didn’t save him, but since I wasn’t really feared my Fortune hex was still up so that saved him. I got tired of that and used my new anti-necromancer ray, Lightning Bolt. We go all the way to Carrion Hill to get Zurax raised, then go all the way back to Feldgrau, where everyone but a local ghost has skedaddled. Boring. And then we head to the big neon signs saying Thrushmoore. On the way we had a great encounter – Nigel sneaks off and comes across two nymphs bathing in the lake. He spies on them, making both Fort saves against blindness. He reveals himself with a “Hey laydees!” and then makes both Fort saves against stun! They say “Ooo you have to catch us!” and he promptly rolls a natural 20 and the fleeing nymph rolls a natural 1. “Whoops, I have fallen over this log and my dress has come off!” He comes out of it with a goofy grin and a nymph-hair token that makes him super hell on wheels as a bard (+4 on Will saves, Craft, Perform, and 7 bonus rounds of bardic performance a day!!!). Then we come across a marsh giant who demands tribute; Zurax animates a zombie from a Kellid werewolf corpse he’s keeping, Nigel tramps it up, and we send it to its fate. Finally we end up in Thrushmoore, aka Innsmouth, and get the obligatory Lovecraftian town setup. It’s just a little too much on the nose, how each adventure is “this thing themed!! !” But, what the heck, we’re level 8 now. This entry was posted in session summaries and tagged actual play, adventure path, broken, Carrion Crown, horror, moon, necromancer, Paizo, Pathfinder, RPG, RPGs, session summary, story time, werewolf. Bookmark the permalink. I didn’t mind the strong — you might say overbearing — themes of the individual adventures but the general structure of the campaign was something of a disappointment. I think the moment it fell apart a bit for us was when we found a map on one of the Whispering Way members at the werewolf temple thing and it only had the locations we’d been to and Feldgrau, even though it made no sense at all for them to have an incomplete map. I think the campaign would have been stronger if it had more of a hub-like structure with the player-characters able to take on the various cult minions in any order, like in Masks of Nyarlathotep. I’ve been told that this isn’t possible in level-based games like Pathfinder but I’m not convinced. All that said, aside from one poor chapter — you haven’t got to it yet but I think you’ll get more out of it than we did — we had good fun with Carrion Crown and it’s got a lot going for it. We had a bunch of Something-Good characters so we had reasons to battle the cult but the same reasons got in the way of what the writers wanted us to do in the aforementioned later chapter so we ended up skipping a lot of it. Oh yeah they love making you team up with the baddies in APs. It was edgy the first (succubus in RotR) and maybe the second time, now it’s just part of the formula. Yes, “go and defend these vampires from a serial killer” didn’t go down too well with a paladin, a cleric, an undead-hunting ranger, and an undead-fighting necromancer. The silly thing is that all of these types were suggested in the player’s guide for the campaign so it’s not like it was unexpected!